It’s time for the Oscars. As Hollywood celebrities and cinematic auteurs prepare to walk the red carpet, we talked to a group of Wellesley faculty who study film across disciplines and asked them to share their thoughts about the movies that intrigued them in the last year, whether nominated for an award or not. I find Her fascinating for what it doesn't do: That is, it doesn't make a spectacle out of human-computer relationships. While it is the key plot point in the movie, for the most part it is presented as something many people do in Spike Jonze's future society. I think this is important, for we all have deep, personal relationships with our computational devices. We often feel as if we've lost a part of ourselves if we lose our "smart" phone. We name our computers, express admiration or frustration at them, and entrust them with the most intimate details of our lives. We already create these narratives with our devices, and we all have to admit that occasionally we treat other humans--even our loved ones--with less-than-full attention. So the fact that Samantha is a "simulation" is not necessarily as worrying as it might be, if we honestly reflect on how we interact with other humans already. That latter fact should be something that concerns us. Yet there is something more deeply troubling about Jonze's world, and that is its antiseptic quality. It is as if we have walked into a contemporary design showroom. Everything is in its proper place; trash is nonexistent. The primary characters are white, upper-middle class; we see nothing of the invisible workers who make this world exist. If this is an image of the future, then its cleanliness concerns me much more than Samantha's behavior. What has happened so that we only see a clean L.A./Shanghai mashup? Where are all the other people that live in those cities, but don't exist in Jonze's world? Where are the workers, the programmers, the labor that created Samantha? Jonze's world functions too smoothly, and I worry that it perpetuates an ideology that erases the difference and the friction that are present and necessary in a plural society. Steve McQueen's adaptation of the true story of Solomon Northup, a free black man who was kidnapped and sold into slavery in the antebellum South, captures the imagination and hearts of audiences. McQueen's use of the stylistic devices of overlapping sound design and editing styles, memories, juxtaposition of incongruous visual images, and repetitions help create an episodic format of a masterly independent film. The character Solomon demonstrates the determination that people use to struggle to survive and gain their freedom and dignity. The film's relevance lies beyond the cinematic devices that won nominations to categories such as "best picture," "best director," "best supporting actor and actress," and "best production design." It resides in the film's ability to awaken the conscience in times that are often called post-racial/ethnic, post-liberal, etc. Palpable and invisible actions and systems that continue to dehumanize and divide people into free and not- free abound in our age. Those who watch 12 Years for entertainment will discover richness and complexity in the personal story that can educate and challenge them to pay attention to how our prejudices secrete themselves in our words, actions, and policies that continue to deceive, capture, and enslave people in our day. Also, those who stand in solidarity with victims are never forgotten. I really don't care too much about which film actually wins an award but I do watch for which films get the exposure by being nominated. I'm going to say (perhaps a little predictably) that I'm really pleased that 12 Years a Slave has been nominated in various categories. Despite the hype I think the film stands a good chance to be crowned with "best picture" and/or for the superb performance by [Chiwetel] Ejiofor, and the kind of mesmerizing characterization that McQueen has serially extracted from Fassbender (whom he has directed before) here as the unrelentingly vicious Epps. However, for me, although the film did manage to bring the story with McQueen's characteristic vividness to the audience, this very vividness in some ways disallows the film to be thought provoking beyond the strong sensations and immediacy of the film experience. I think it really falls a little short on asking probing questions about a variety of very fascinating issues beyond raising them; for example, about the relationships among slaves. I would have liked to see Sarah Polley's Stories We Tell nominated—but then, perhaps not being nominated is another kind of big compliment…. The director Jia Zhangke obviously pays homage to King Hu, whose A Touch of Zen is a classic made in Taiwan in the 1970s, which also inspired Ang Lee's Crouching Tiger Hidden Dragon. Jia made a very impressive contemporary answer to King Hu's moral question about the possibility of redemption, which was asked in A Touch of Zen, a film set in the last days of the Ming Dynasty when moral corruption prevailed. A Touch of Sin is about contemporary China and it also shows a world of moral bankruptcy. But in today's China, the redemption seems to be more impossible than four hundred years ago (or four decades ago, when King Hu made his film) when "a touch of Zen" was still possible to be found in people's heart. A Touch of Sin is violent and angry. The four stories Jia tells in the film are all based on well-known murder cases or suicides happening in China recently. When the murderer's instinct took the heart of an ordinary person, it's difficult to say whether the film shows sympathy with them or simply portrays the world as increasingly immoral. Jia's film presents a very depressing reality about today's China. The film has interesting (but also distressing) allusions to four animals: the horse that is beaten to death, the duck that is killed, the snake that looks so menacing but is used as a toy, and the fish that is given a dangerous freedom. These animals are connected to the characterizations of the four protagonists. The film is at the same time highly realistic and symbolic. This film did not get released in China due to censorship so it had no way of representing China in the competition for Oscars (in the categories such as the best foreign language film). But in my mind it's one of the most powerful films of 2013. Luckily it has been released in other countries and received critical acclaim. It's on Cahiers du Cinema's Top 10 list of 2013. When it comes to the Oscar awards, I go straight to the documentary category--it is in documentary film that all the creative energy lies these days. Especially this year (2013, and watch for even more in 2014), we see not only innovation, but tremendous courage. The film that has earned all the buzz among documentary filmmakers and critics this year is The Act of Killing. It's not an easy film to watch, but it is an important film. It raises questions on every level: the ethics of filmmaking (should the filmmaker have foregrounded two killers in this way? how does a filmmaker decide whether to include remarks that participants might later regret having made on film? ); the role of cinema in our lives; the nature of "reality" (over and over in the film, I found myself asking: Is this "real"? Did he "really" say that?). The film has tremendous style—and thus raises questions of style in relation to subject. I ended my viewing, though, with tremendous respect for the filmmaker, Joshua Oppenheimer. And I have not been in any setting—from Sundance to the Flaherty Film Seminars to private conversations with local filmmakers—in which this film did not come up, and it always produces extended and serious conversation. If I could give an Oscar to any of the films that have been nominated, there would be a tie for best picture: American Hustle and Nebraska. Both tell the myth of American self-invention, rising (or not) from the station into which you were born. As Amy Adams instructs Christian Bale: “We got to get over on all these guys.” In Nebraska, the patriarch and his son stumble into the mythic farmhouse of origin only to find it’s a hollow wreck that will soon collapse. Self-invention fails. But the con artists of American Hustle make it. They get over on all those guys. In addition, the black and white cinematography of Nebraska is stunning, the empty fields and wide sky telling a story with few words. Japanese directors clung to black and white film long after color came into wide use in global cinema. This film shows why. 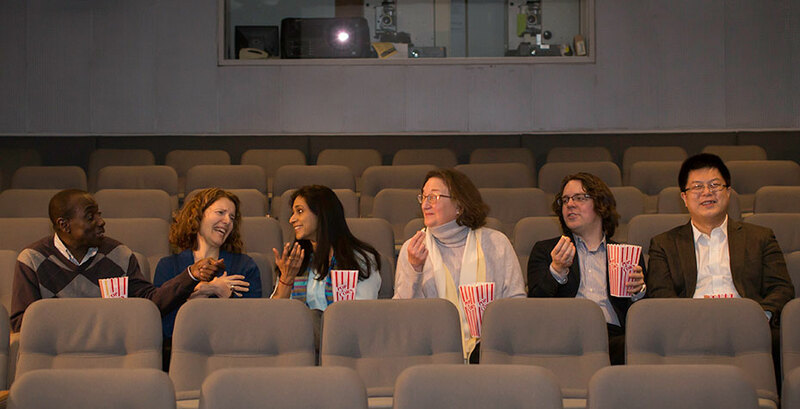 Oscars or not, we love the movies at Wellesley. Looking to watch great films on campus? Check out Cinephile Sundays and the Wellesley College Film Society for more.